Is the iPad Bill Gates' Next 640K Moment? 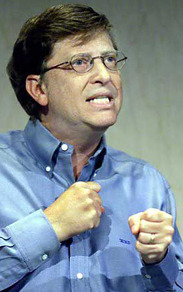 Somehow, I have a feeling Bill Gates' recent comments on Apple's iPad will come back to haunt him. Gates' remarks on the iPad remind me of the “640K should be enough for anybody” quote that he reportedly said at a microcomputer trade show in 1981, in regard to the Intel 8088's 640K memory limit. Gates denies that he ever uttered those words, which is fine, because dissing the iPad lacks just as much foresight. It's interesting enough that Gates admits he thought the iPhone outdid Microsoft's smartphone efforts, but that's an easy call to make. Smartphones existed when the iPhone was revealed, so there was a basis for comparison. Not so with the iPad, which will beat similar tablet devices to market. It's a new category and no one knows if it's going to take off, but I have a feeling it will, if done right. The true potential of tablets is not to bridge the gap between smartphone and netbook, but between entertainment and productivity. The iPad's not there yet in its current state -- proprietary input and lack of a Web cam are major drawbacks -- but with the iWork suite for iPad, Apple's clearly moving in that direction. And when the virtual keyboard won't do, there's always the iPad keyboard dock. At the very least, I'm not counting the iPad out. Granted, I didn't build a revolutionary computer company. But as a Web writer I know that snap judgments of mold-breaking new products is dangerous territory, lest someone dig through the archives some day and make you look foolish. If that happens with the iPad, Gates won't be able to deny what he said.